In the world’s richest countries, some children do worse at school than others because of circumstances beyond their control, such as where they were born, the language they speak or their parents’ occupations. These children enter the education system at a disadvantage and can drop further behind if educational policies and practices reinforce, rather than reduce, the gap between them and their peers. These types of inequality are unjust. Not all children have an equal opportunity to reach their full potential, to pursue their interests and to develop their talents and skills. This has social and economic costs. 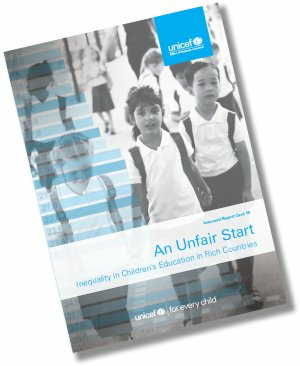 This report focuses on educational inequalities in 41 of the world’s richest countries, all of which are members of the Organisation for Economic Co-operation and Development (OECD) and/or the European Union (EU). Using the most recent data available, it examines inequalities across childhood – from access to preschool to expectations of post-secondary education – and explores in depth the relationships between educational inequality and factors such as their parents’ occupations, migration background, the child’s gender and school characteristics. 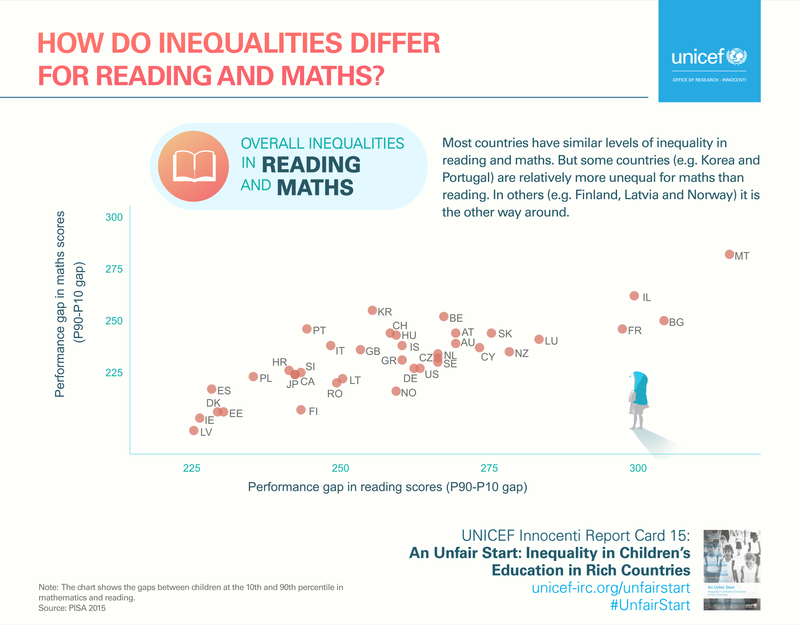 How much educational inequality is there in rich countries? Does it vary between countries? To what extent do children’s starting points, circumstances and characteristics explain educational inequalities? How does this vary between countries and across the different stages of education? To what extent do education systems and schools magnify or reduce inequalities between children caused by the factors listed in these sets of questions? What policies and practices can help reduce inequalities? 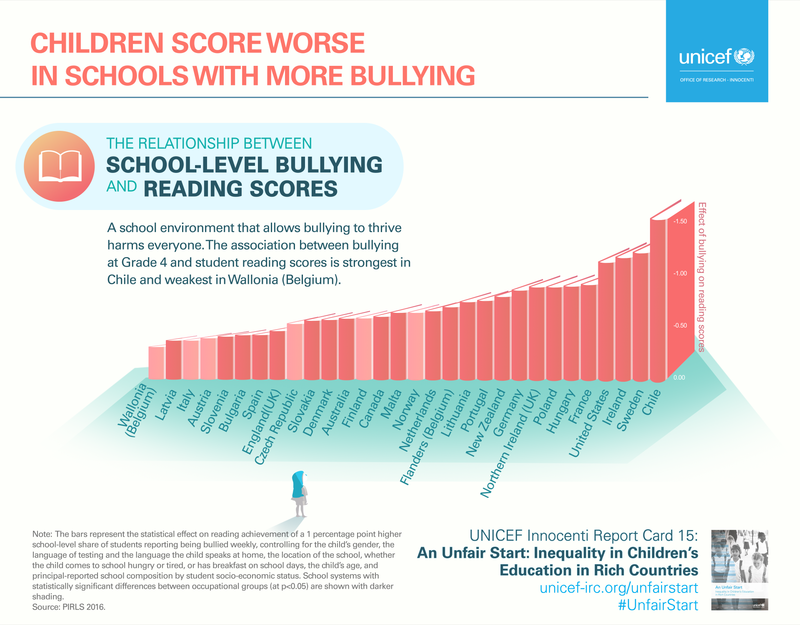 The key feature of an Unfair Start is the league table which summarizes the extent of educational inequalities at preschool, primary school and secondary school levels. 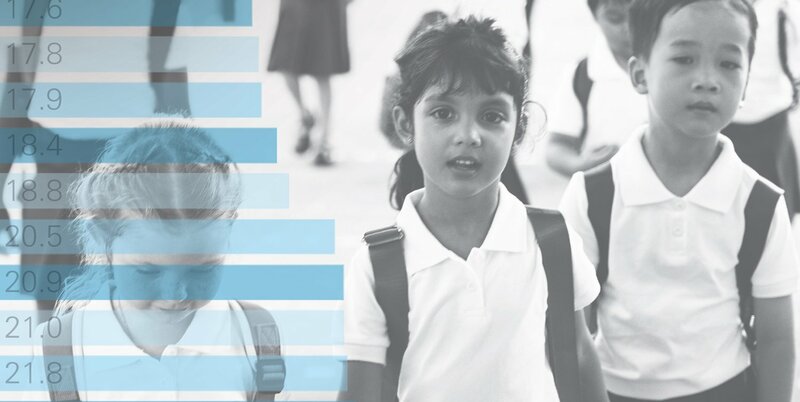 The indicator of inequality at preschool level is the percentage of students enrolled in organized learning one year before the official age for entering primary school. The indicator for both primary school (Grade 4, around age 10) and secondary school (age 15) is the gap in reading scores between the lowest- and highest-performing students. Countries can have different degrees of educational inequality at different educational stages. Ireland and Slovenia are in the bottom third of countries (high inequality) for preschool enrolment, but move to the top third (low inequality) at secondary school. France has one of the highest rates of preschool enrolment but then falls to the bottom third in secondary school. The Netherlands goes from being the most equal country in primary school reading scores to ranking 26th (of 41 countries) when children are 15 years old. The benefits of preschool education can be long-lasting. According to the OECD, 15-year-olds who report having had more than one year of pre-primary education do substantially better at reading than those with no pre-primary education, even after accounting for the child’s economic and social position. Studies that follow the same children over a period of time point to an array of long-term benefits. Providing universal access to early childhood learning and care is a potential means of reducing inequality. There are already large differences in children’s skills when they start primary school. In almost all countries, more than 10 per cent of children do not reach an intermediate level of reading proficiency expected at age 10. The end of compulsory schooling is an important stage in a child’s journey through the education system. By the age of 15, which is when this stage of education ends in some countries, children should have acquired essential knowledge and the skills that will help them make their way in the world. However, in all countries, there are also large inequalities in children’s reading scores at 15 years old. Latvia, Ireland and Spain had the lowest levels of inequality at this age. Malta, Bulgaria and Israel had the highest. 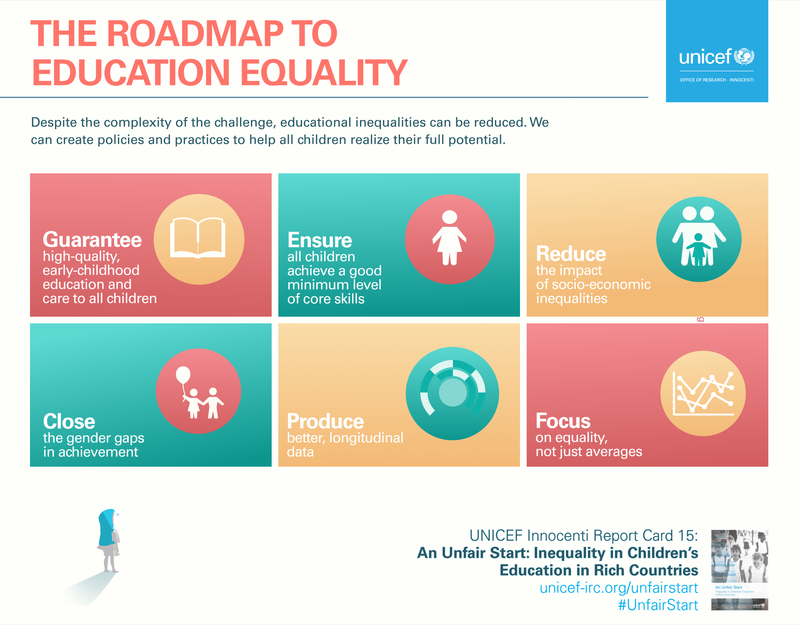 Education policies and practices can reduce or reinforce educational inequalities stemming from children’s starting points and ongoing family circumstances. There is no one-size-fits-all policy guaranteed to produce the best results. Countries and regions differ in their social, cultural, economic and political make-up. What works for those at the top of our league table will not necessarily help those at the bottom to reduce educational inequalities. A number of key policies and practices have a bearing on inequalities both within and between schools[i] in particular countries or contexts. These include practices such as grade repetition, streaming and tracking. Other policies relating to school choice and to school transfers and expulsions may reduce the diversity of children within schools, potentially increasing educational inequalities. Where children are sorted into different streams within schools or go to different schools based on their academic performance, children from less privileged families tend to be over-represented in the lower tracks, with fewer opportunities in the future. This is especially the case when sorting takes place at a very early age when children have not yet managed to develop their potential. 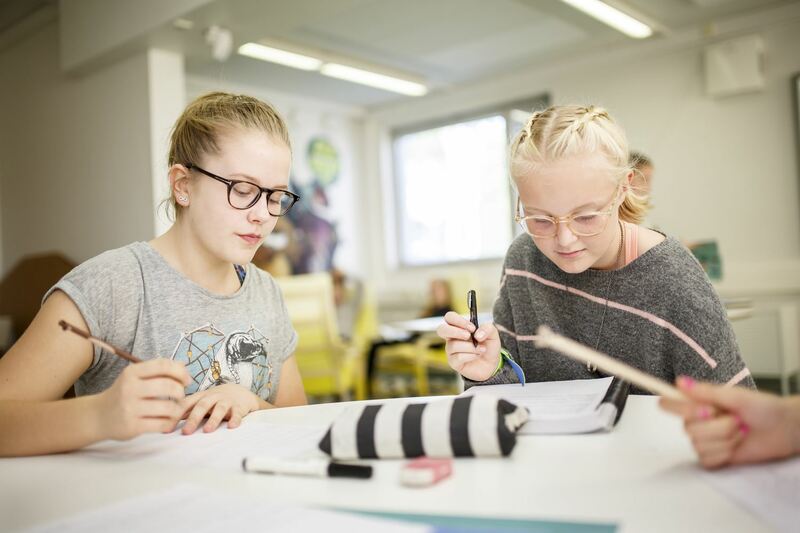 The report analysis found that educational inequality is pervasive, but that some affluent societies do better than others in making sure that the lowest-performing students do not lag too far behind their highest-scoring peers. This offers hope and the potential to learn from different educational policies and practices. Contrary to the view that higher standards require greater inequality between children, there is no trade-off between lower performance gaps and higher average achievement. Making an education system more equal does not mean standards must sink to the lowest common denominator. 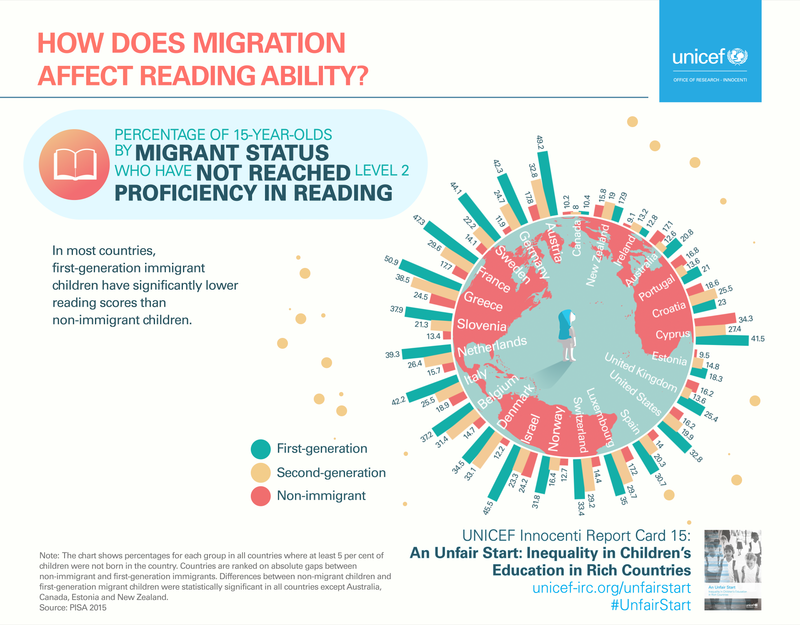 Both primary and secondary school students are more likely to achieve a good minimum level of reading proficiency in countries with smaller gaps. High income is no guarantee of high equality. Some of the poorest countries included in this report, such as Latvia and Lithuania, have higher preschool enrolment rates and lower inequality in reading performance in primary and secondary school than those with far greater resources. However, almost universally, children from less privileged families do worse. Yet, the data reveal there is much more inequality within countries than there is between countries. 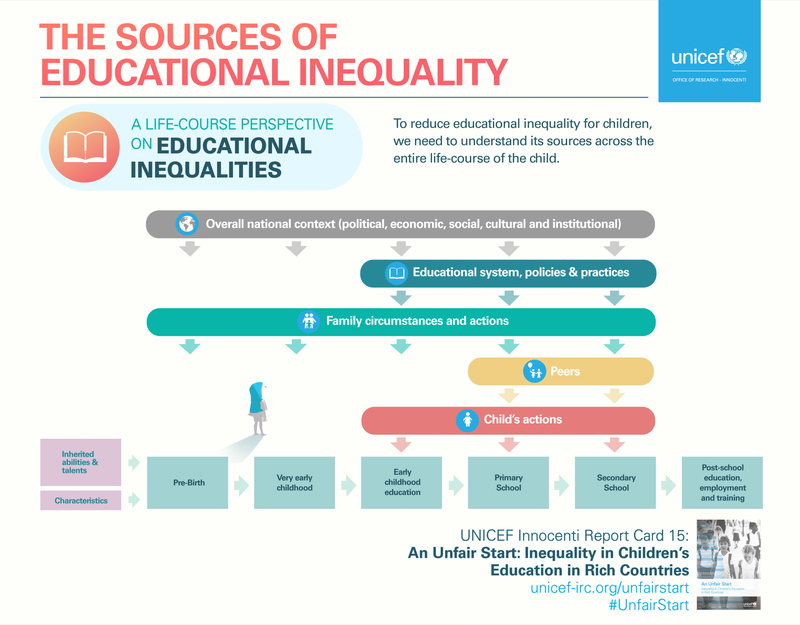 What can be done to reduce educational inequalities? Ensuring that all children have access to high-quality preschool learning opportunities plays an important role in reducing socio-economic inequalities that already exist when children start school. A key test of any education system is that it provides all children with the basic skills needed to participate fully in society. This should be a baseline requirement for an equitable education system. Through a combination of family allowances and public services, rich countries can ensure that all children are able to enjoy learning, develop varied interests and achieve their full potential. Reducing the segregation of children with different family backgrounds into different schools can also help to ensure that all children have equal opportunities. Policy makers and educators need to ensure equal engagement of boys and girls in all core subjects, paying attention to the gender mix of teachers and challenging gender stereotypes every step of the way. Not enough is known about how inequalities develop and persist in different contexts. More high-quality, cross-country, comparable evidence is needed to fill these gaps. Longitudinal studies that follow the same children as they grow would be particularly valuable. Policy and public debates should also be more fully informed by the international surveys that are already available, such as the ones used in this report. International comparisons should consider not just how countries are faring in average educational performance but also the amount of inequality among the students in each country. Greater equality does not come at a cost of average achievement and both are necessary to give all children a fair start. UNICEF enjoys the unique privilege of maintaining a global research centre for children based at the nearly 600-year-old Ospedale degli Innocenti in Florence, Italy. Established in 1419 by the influential Silkworkers Guild, Innocenti can be viewed as one of the earliest efforts by secular authorities to elevate.